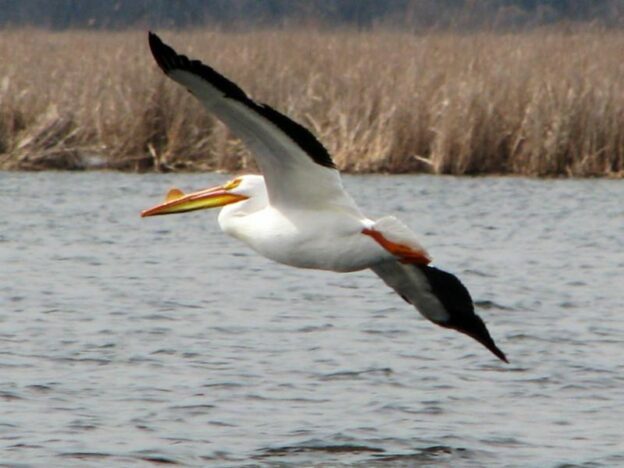 The American White Pelican can be seen this spring in fresh water lakes and marshes across Iowa and North America on their way to their summer grounds up north. They have the second largest wingspan of North American birds with a span of nine foot, only behind the California Condor in size. They can weigh up to 30 pounds with 11 -20 an average. They are bright white except for blacks edges on their wing ends. They eat around four pounds of fish and crayfish daily by fishing for it as the fish swim by. They are unlike the Brown Pelican who dives for their dinner. The spring migration to the breeding grounds occurs in March and April. During spring breeding both male and females develop a small horn on their top beak that later falls off after breeding and egg laying. Nesting begins early April through early June. After one week of courtship and egg laying, the male assists the female with incubating the nest of 2 to 3 eggs with 6 the maximum laid. They incubate for a period of one month. The juveniles leave the parents care around three weeks after learning to fly. The Pelicans leave for their winter grounds along the Mississippi River (south of Saint Louis), Pacific and Gulf of Mexico coastal lakes in September and October. Currently the North American Pelican has a stable population. However, due to human impact, they suffer habitat loss, nest abandonment, fishing gear entanglements, poaching and boating disturbances. This entry was posted in Conservation, Educational on March 18, 2019 by Pamela.